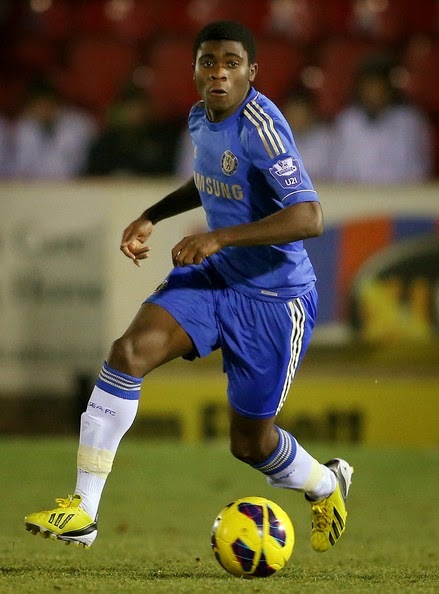 I think pretty much everyone familiar with Chelsea's academy is well aware of what Jeremie Boga is all about. Quite possibly the most skilfully gifted player that has come through the academy and it is quite staggering that he is only now just signing his first professional deal and is still only 17 years old. Last season was a mixed one for Jeremie, he has some sparkling performances and he also had a season struggling with injury at times. Still he featured across all 3 levels of the academy sides this season making 7 starts and scoring 5 goals at U18's level, 5 starts and 1 goal at U19's European level and most of his appearances coming for the U21's with 15 appearances and 2 goals. If Jeremie stays fit this season then it could be a big season for the young man and he will be a vital cog to the U21's side this season and looking to make them tick. George is another Chelsea youngster with famous family being the Nephew of Karen Brady who joined the club in 2012 and had trialed at the club before and having been born in France played for both Monaco and Cannes. George is a center back who has good pace and likes to get stuck into the challenge. George had a good solid season for the U18's last year appearing in a total of 25 games for the U18's this season and even scored 2 goals in that time. George will be hoping for more U21's appearances this season having now signed this new deal as he did not make a single appearance at that level last season. Bradley is a 17 year old goalkeeper who established himself as the regular keeper for the U18's last season making a total of 23 appearances for the side keeping 7 clean sheets in the process. He also made a single appearance for the U19's and a single appearance for the U21's last season. For the coming season a lot depends on what happens with the keepers ahead of him. Jamal Blackman could well end up on loan next season and it looks like Mitchell Beeney could be moving into the first team squad which means there is an opening for Bradley to become the regular U21's keeper for the coming season which would the progress he would be looking for. Having joined the club in March last season from Charlton, Kasey has slowly grown into the side and stated to really show what he is all about. A cultured midfield player who is able to turn on the skill at times Kasey also has a lot more that he has yet to show at the club. A regular feature for the U18's this season he made a total of 25 appearances for the U18's and scored a decent 8 goals. He also made a handful of substitute appearances for the U19's and U21's. This season like the others his main goal will be more game time at the U21's level and that again depends what happens above him, if players like Baker and Swift move on with loan moves then he will have the space to play the games. All these young men have good futures ahead of them at Chelsea and hopefully will all have big seasons ahead of them. As always the place to keep up to date with their development is right here on Chelsea Daft.